Olkhon Island is located in Russia (southern Siberia) in Lake Baikal, and is one of the largest lake islands in the world. 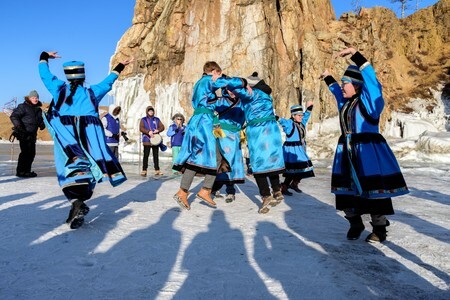 Let's visit this interesting place together, among beautiful winter landscapes and ancient traditions of the local Buryat population. Olkhon island is located in Siberia, not far from the western coast of Lake Baikal, and with its surface area of 730 square kilometers, it is one of the largest lake islands in the world. 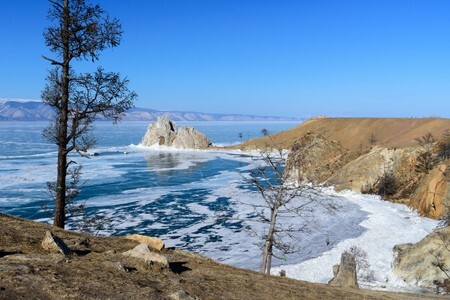 The island is predominantly mountainous and has a maximum altitude of 1276 meters above sea level (therefore just over 800 meters above lake Baikal level). 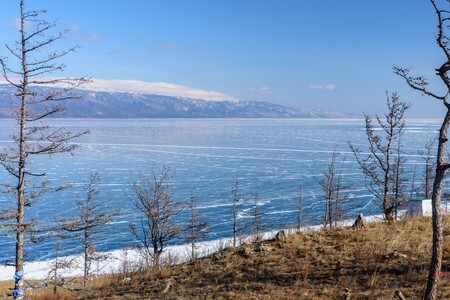 It is covered for about half of its surface by the steppe, while a forest of larch and fir populates the remaining part. 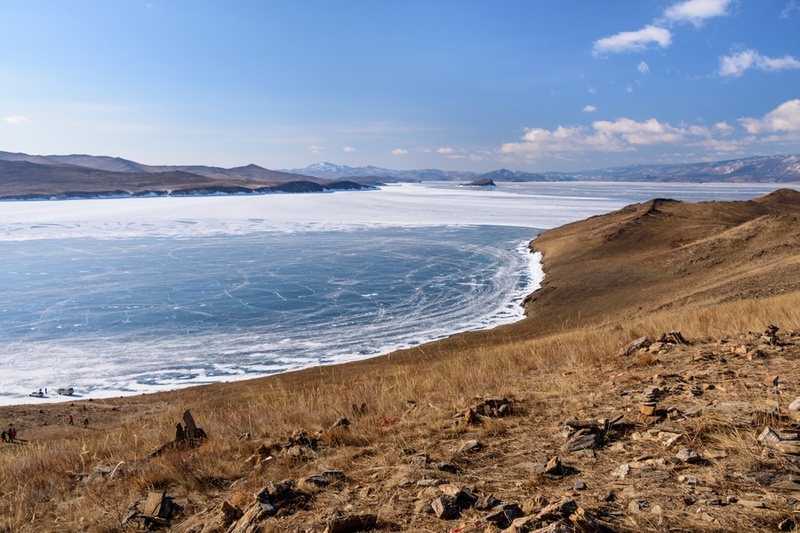 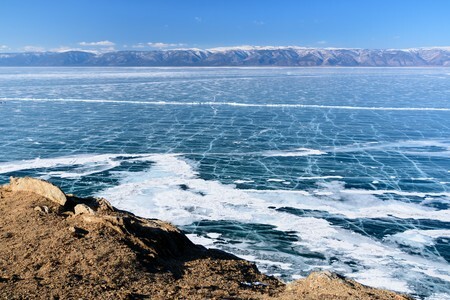 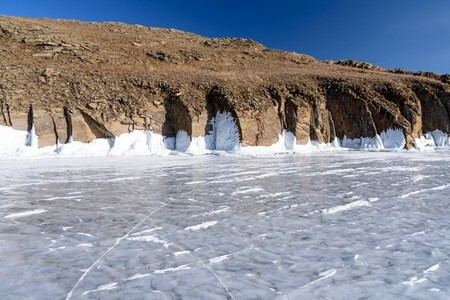 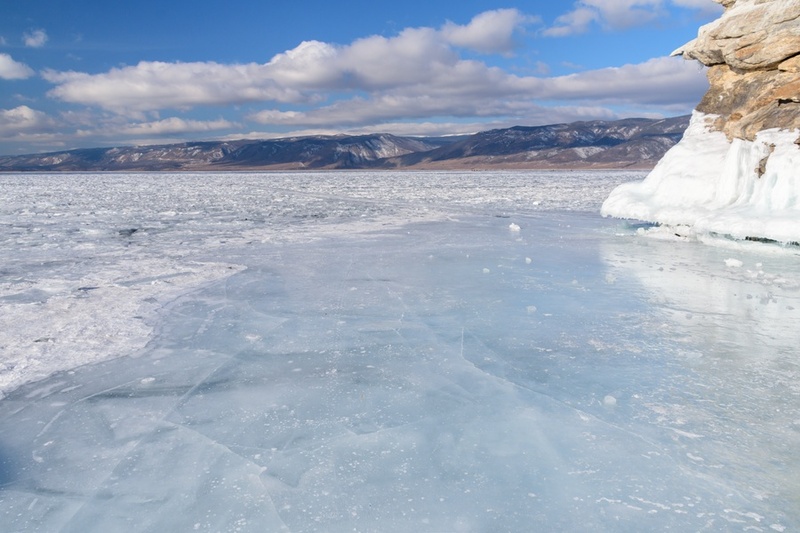 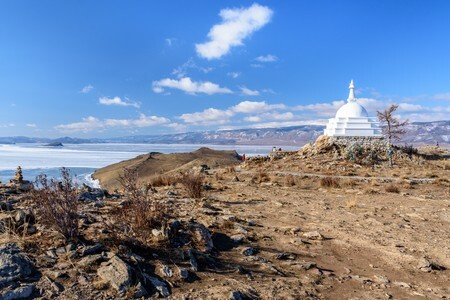 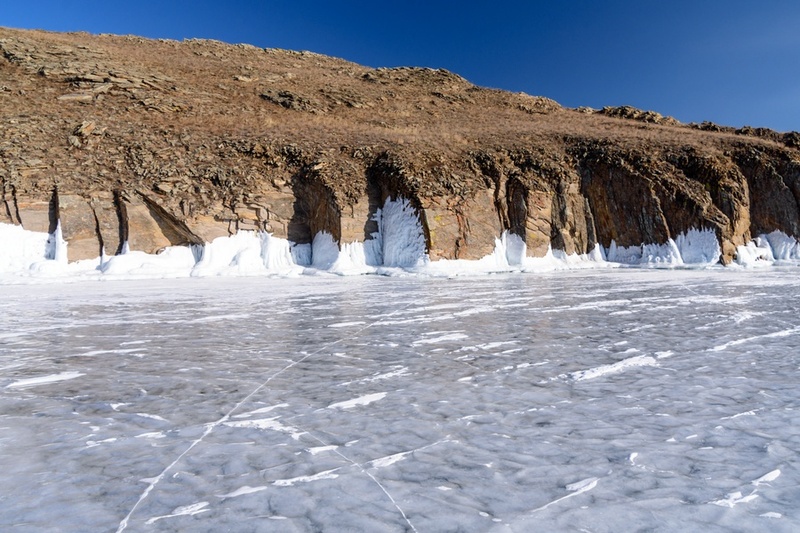 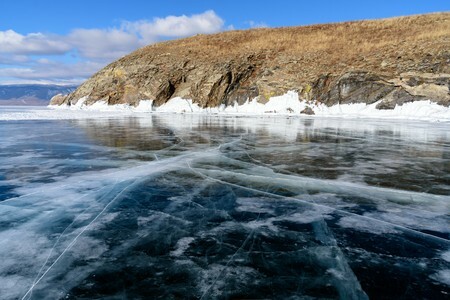 The climate is arid with very little precipitations and is milder and sunnier than the surrounding areas: for this reason, thanks also to very little snowfall, Olkhon island is one of the best places in Lake Baikal to observe transparent ice and other types of clear ice. 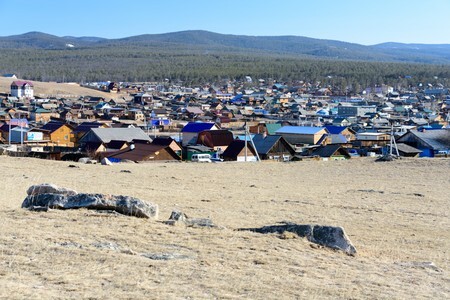 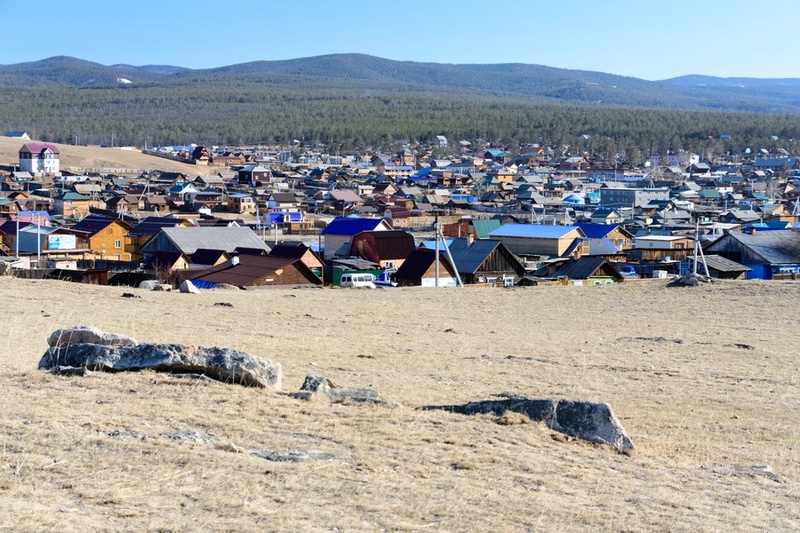 On Olkhon Island there are various inhabited centers housing around 1500 inhabitants, mostly Buryats (ethnic minority of Siberia) who still practice Shamanism, while Khuzhir is the main village. 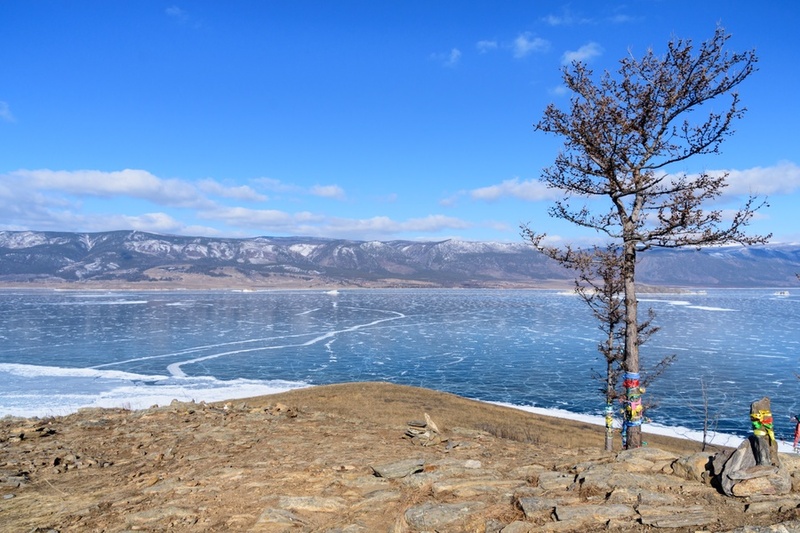 How to get to Olkhon Island? 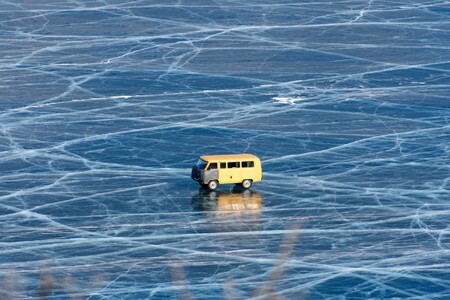 Where to stay? 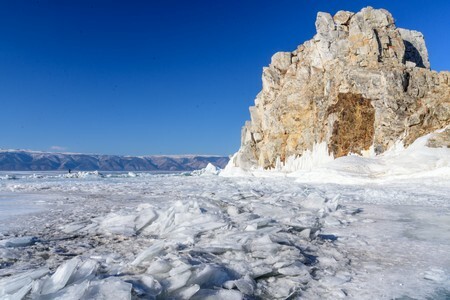 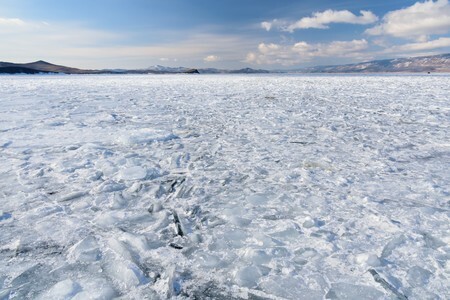 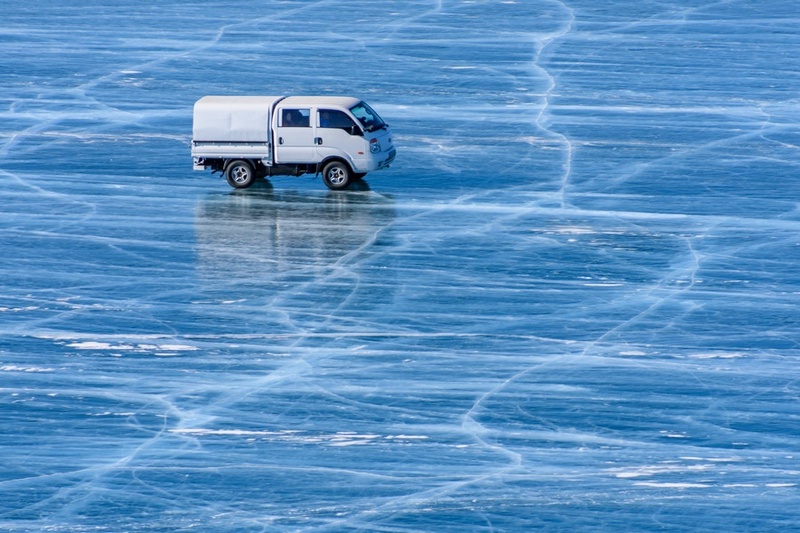 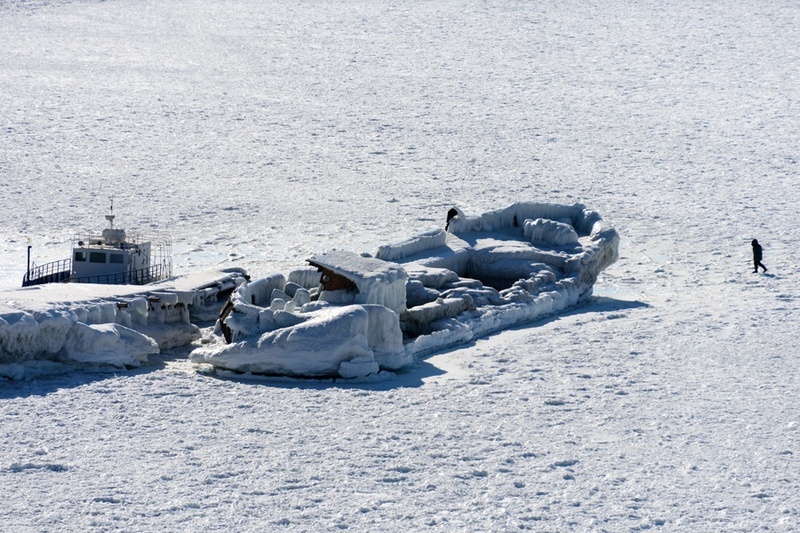 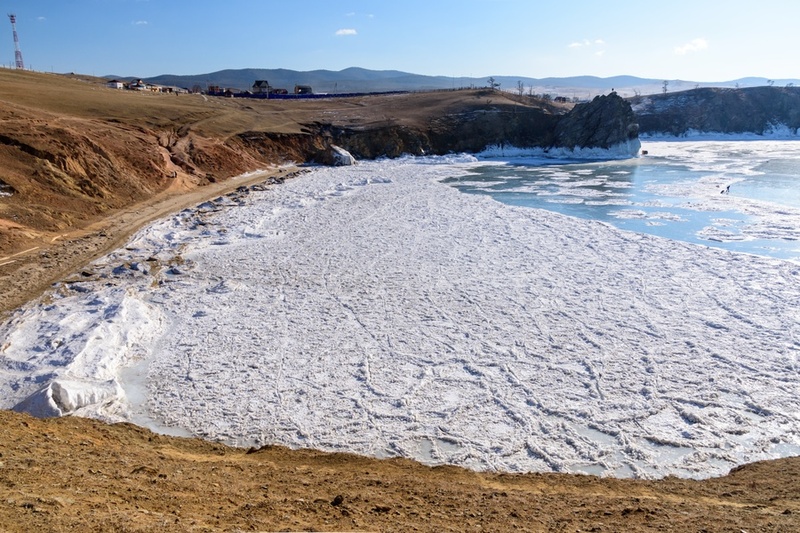 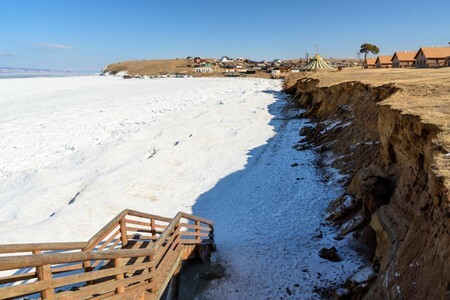 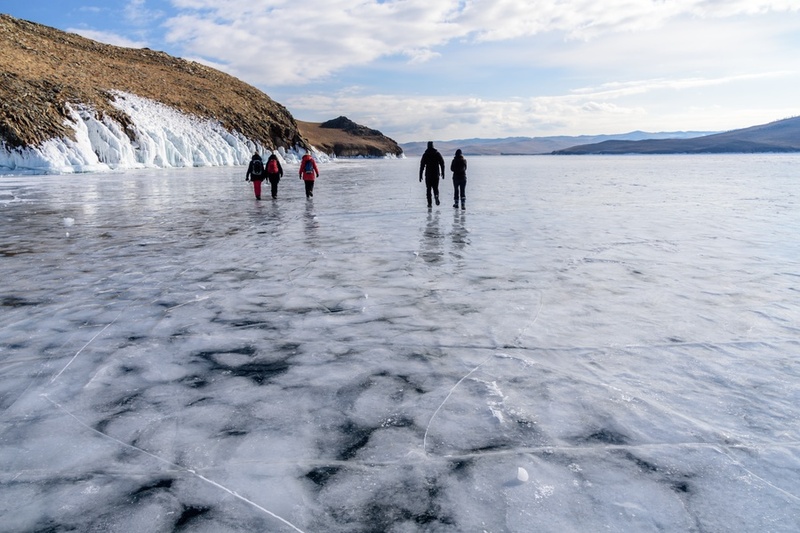 How to get to Olkhon Island depends on the season and the conditions of the ice: during the second half of winter, visitors may cross the ice of Lake Baikal aboard an hovercraft or a 4x4 car, while in summer there is a normal ferry or private motorboat service. Mid-seasons may be more problematic, but there are occasional services by boats equipped with a reinforced hull. The main access gateway to Olkhon Island is village of Listvjanca 200 kilometers further south (proceeding via Baikal lake) even if an unpaved road (usually in very bad condition) arrives quite close to the island (thus making the crossing of the lake much shorter). Olkhon Island is getting every year more and more popular, loved and frequented even by the Russians in addition to tourists from many parts of the world: there are therefore a good number of small hotels and guesthouses, as well as local families providing additional accommodation options. 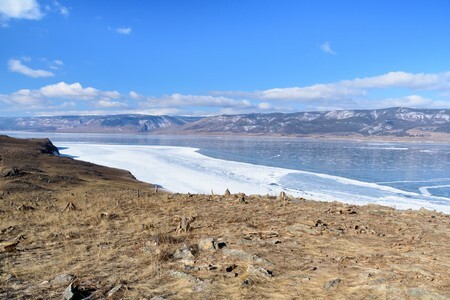 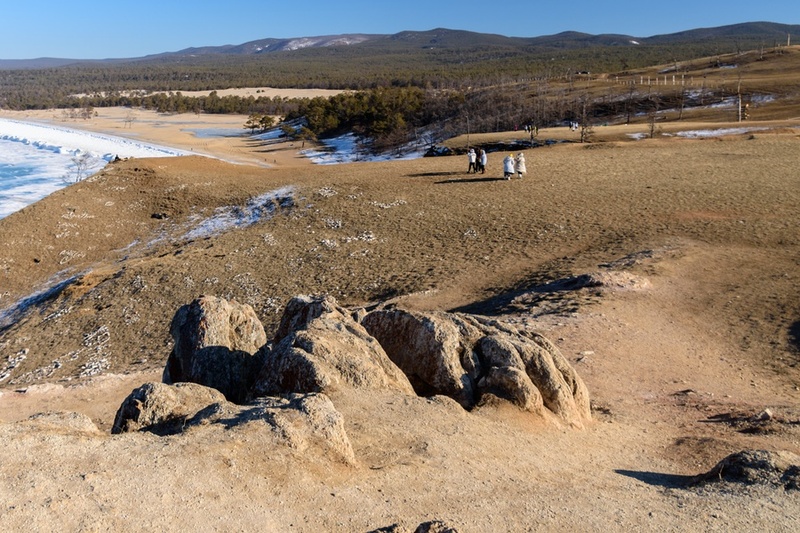 But now, let's see photos of Olkhon Island and learn more about this interesting place. Crossing of the narrow water channel of Lake Baikal that separates Olkhon island from the mainland. 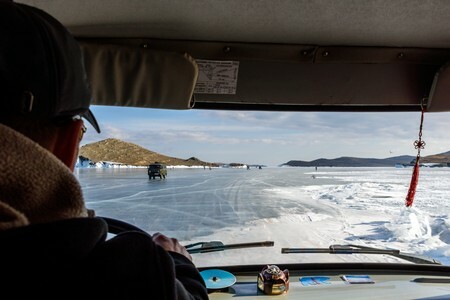 The natural highway on ice is quite busy during this time of the year, while in summer transfers are provided by private motorboats or ferries. 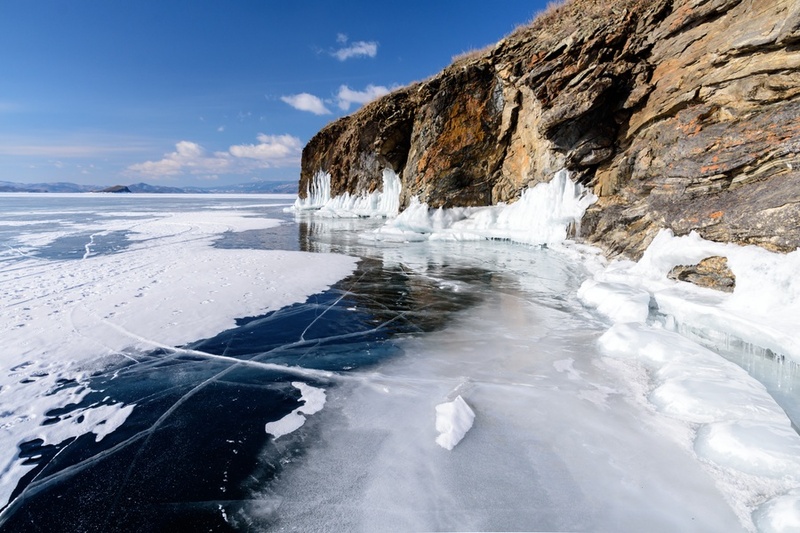 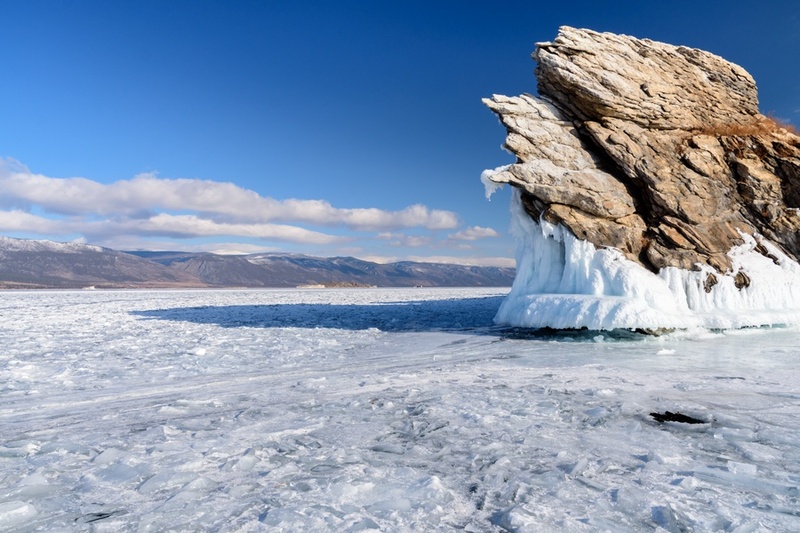 The water channel separating Olkhon island from the mainland, along the western shore of Lake Baikal, is home to some small islands which provide an excellent opportunity to stop and walk around on the ice. 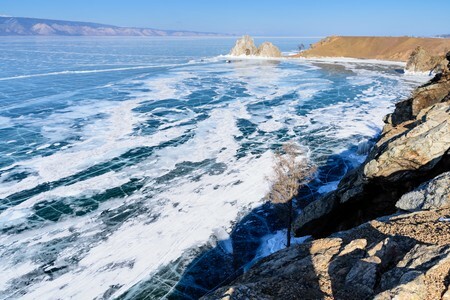 The cliffs more exposed Baikal's waves are covered with ice, because in autumn the sprays instantly freeze on the rocks. 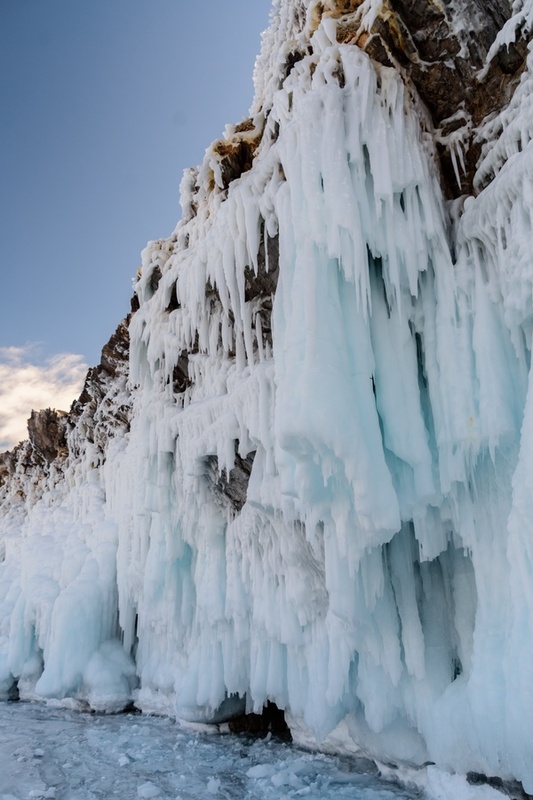 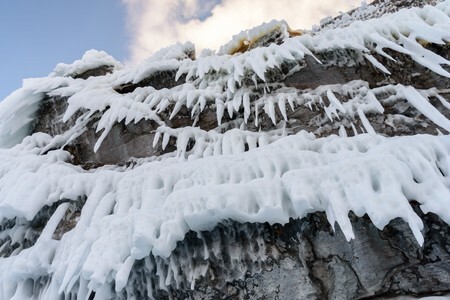 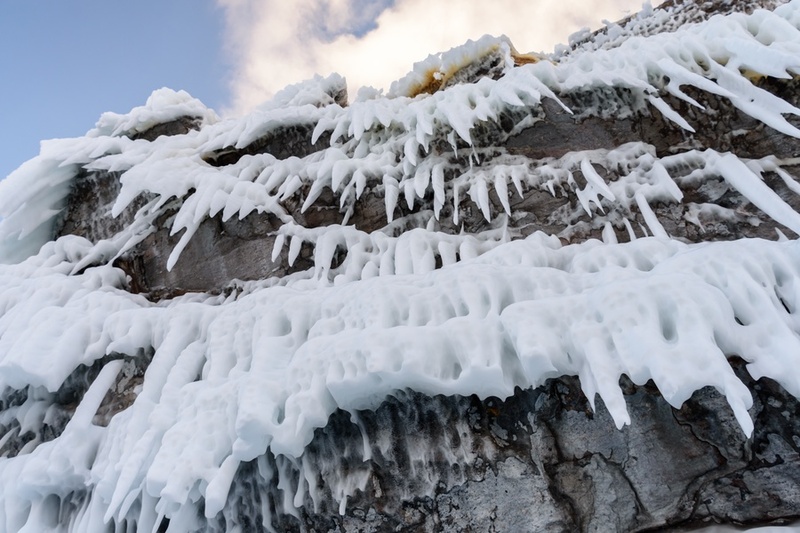 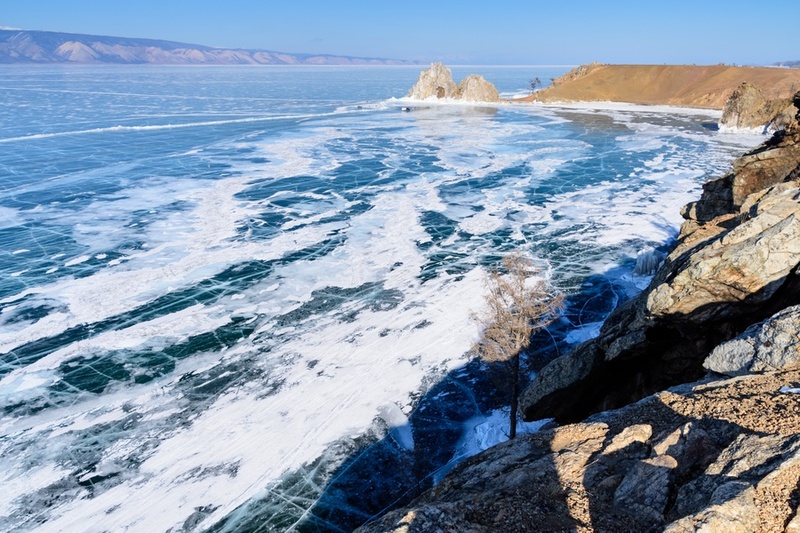 The beautiful cliff covered with large icicles formed in autumn by the spray of water generated by the waves of Baikal lake. Sometimes real mini-caves of ice are formed, with a very blue light inside. 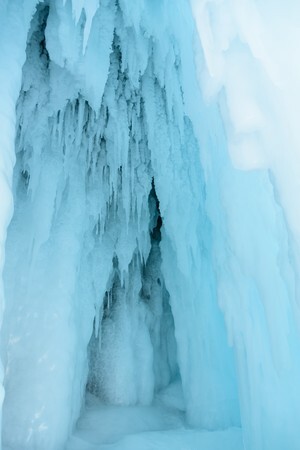 An ice cave where icicles looks like traditional stalactites. 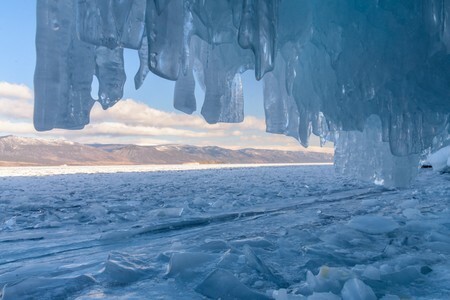 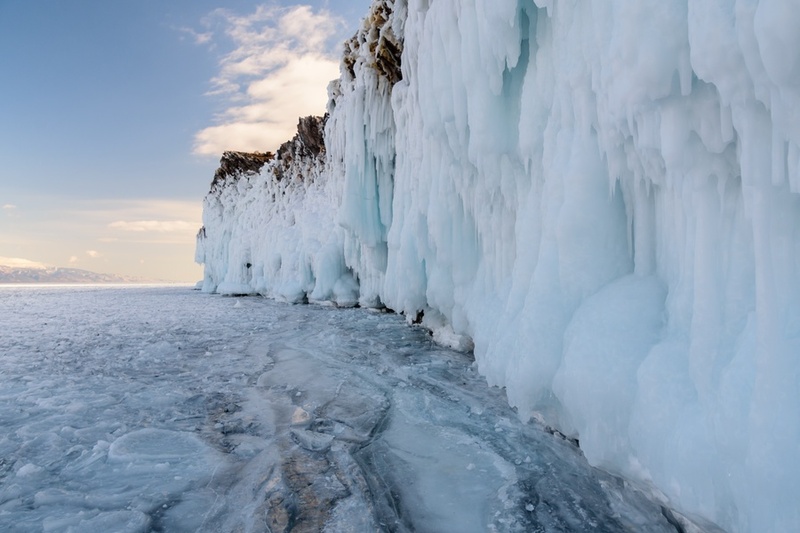 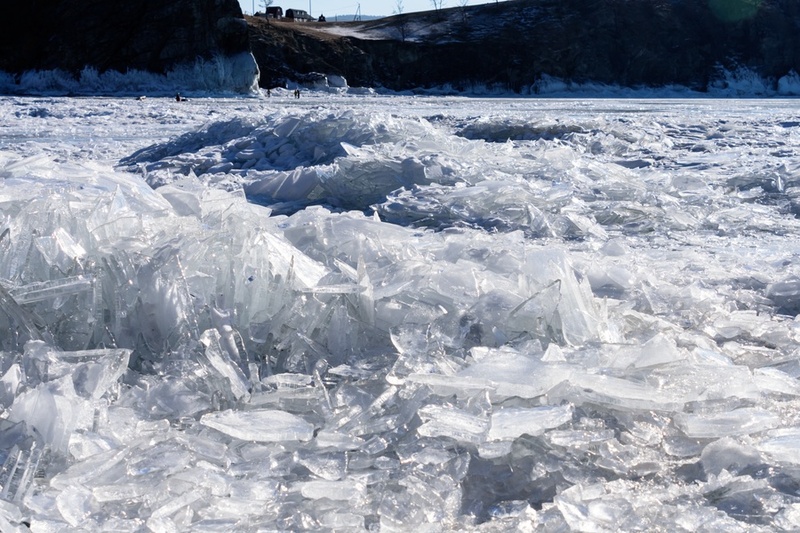 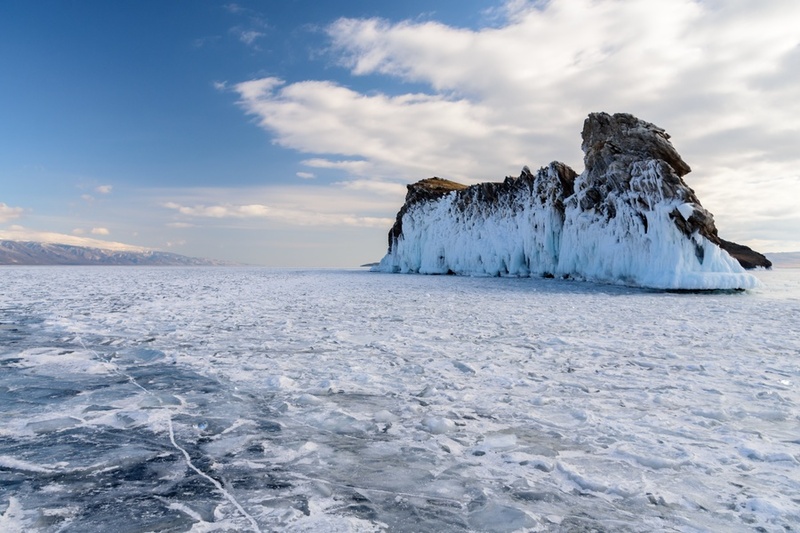 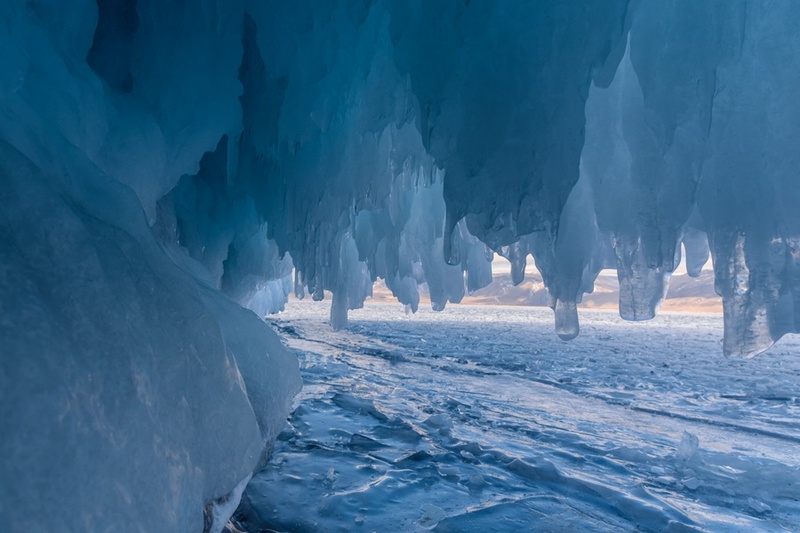 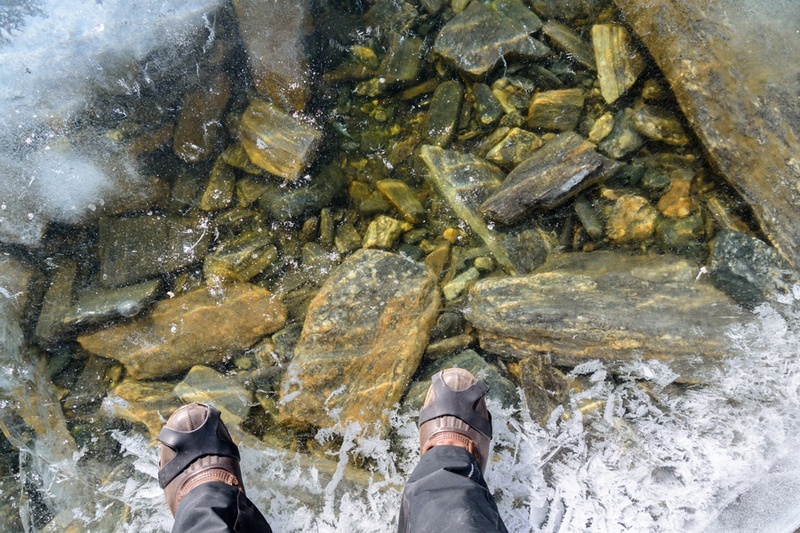 Walking along the shores of Lake Baikal, visitors can enjoy various types of ice, from the classic white ice, to transparent ice with methane bubbles trapped in it. I have no doubt: this must certainly done by aliens. 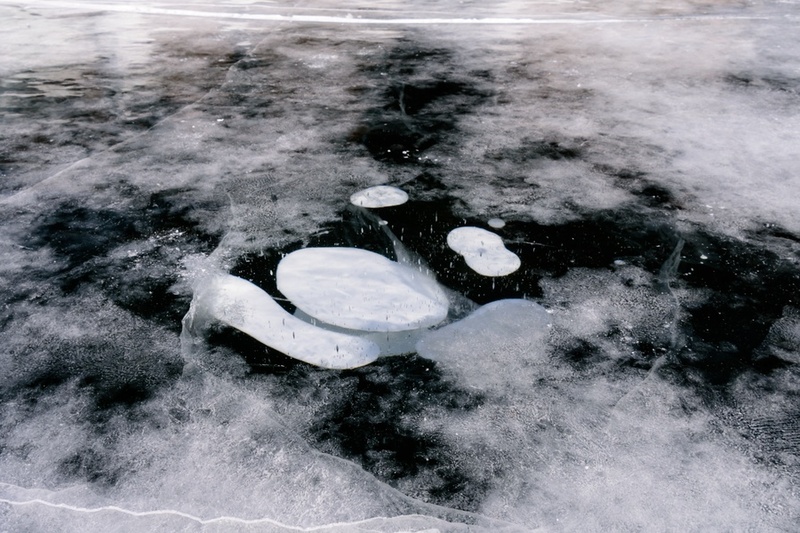 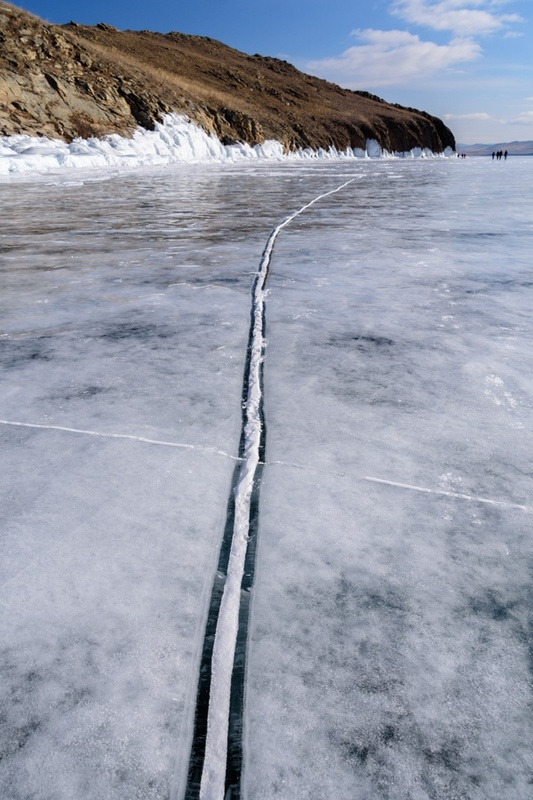 The transparent ice revealing the bottom of the lake, is one of the most intriguing curiosities that can be observed on Baikal. 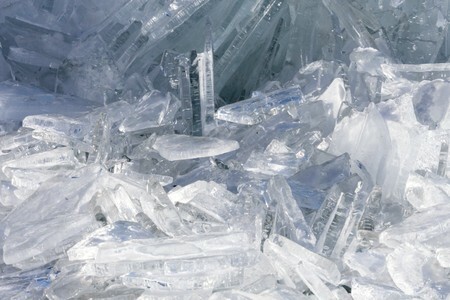 Although it can give the idea of fragility or limited thickness because of its incredible transparency, this ice can easily support the weight of a fully loaded car. 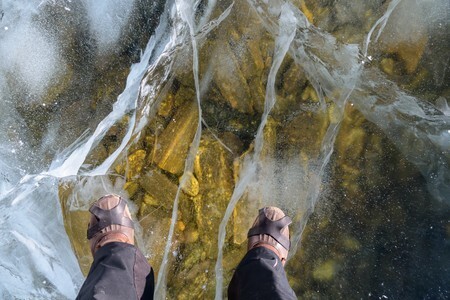 A video showing a walk on transparent ice, which gives the feeling that there is nothing under the feet. 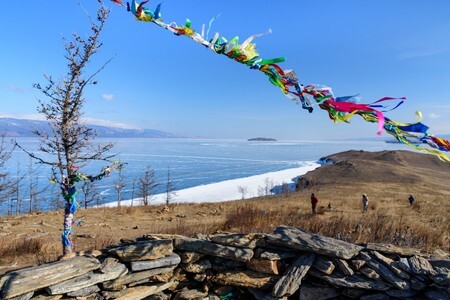 The small island of Ogoy, just off Olkhon Island, is home to a Buddhist shrine built in 2005. It is actually a stupa, a spiritual monument that removes negativity, and is a place of pilgrimage for tourists and locals. From the top of Ogoy island visitors can enjoy a wonderful and endless view onto Lake Baikal with its clean and transparent ice reflecting the blue of the sky. 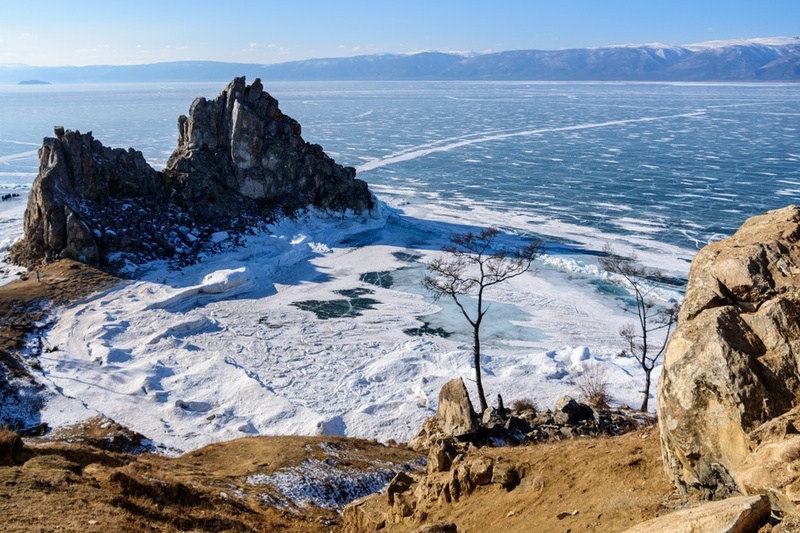 This region of Lake Baikal is a real desert, as both rainfall and snowfall are reduced to minimum: for this reason there is no snow on either ground and Lake Baikal's ice, even though the spring is quite far away. Another short crossing of the ice in a 4x4 and we are on Olkhon Island and its main town of Khuzhir. 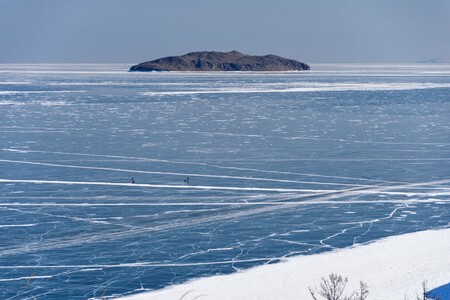 The view that can be enjoyed from the top of an hill not far from Khuzhir on Olkhon Island, with clean ice extending up to the horizon and people using the lake as an endless natural highway. 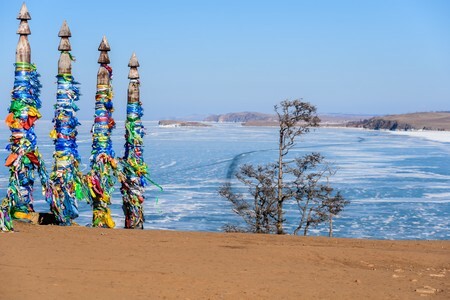 The village of Khuzhir, the main town of Olkhon Island, is mainly known for the Shaman Rock, a promontory considered sacred where feasts and rituals related to Shamanism take place. The indigenous Buryats (ethnic minority of Siberia and inhabitants of Olkhon Island) adhere to Shamanism and believe that the entire island is a spiritual place. The faithful also believe that Burkhan, a modern religious figure of the Altai people, lives right inside this rock. 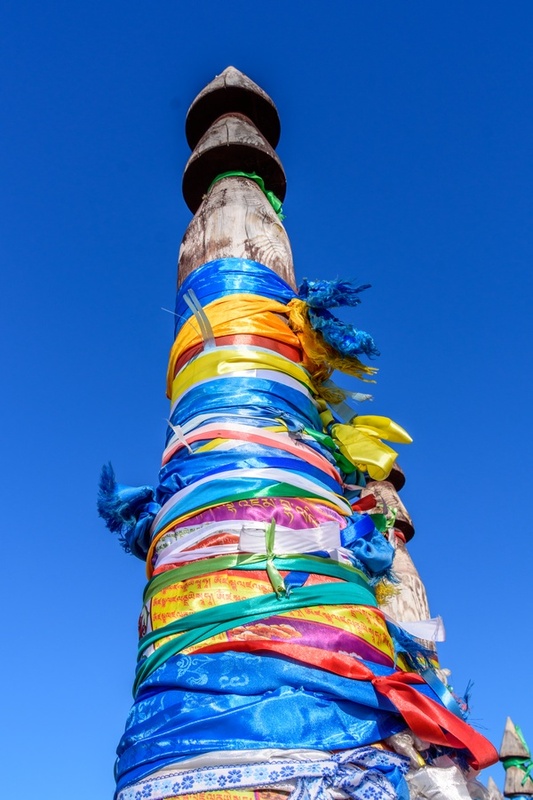 Near the Shaman Rock we find these poles where the faithfuls tie a colored ribbon while expressing a wish. 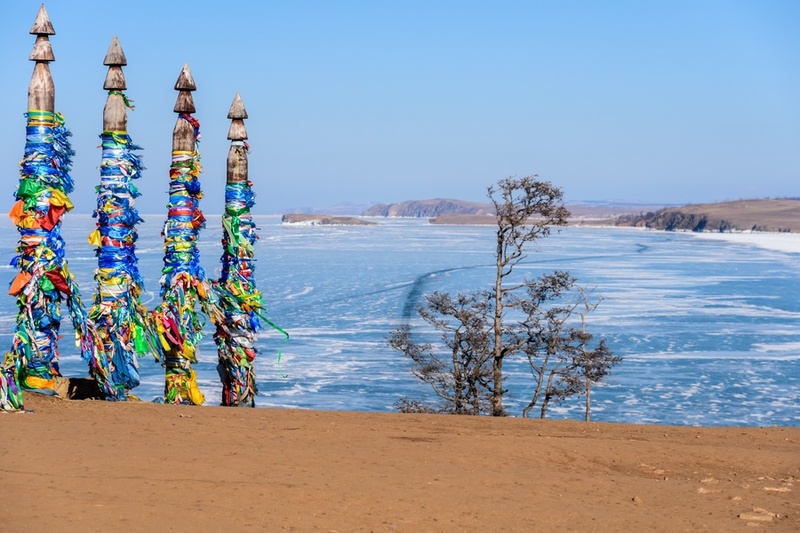 The path to Shaman Rock offers the opportunity to observe suggestive views from the top of an hill, such as the hinterland of Olkhon island, which is quite unusual for Siberia in winter, as it is completely free of snow. But as already mentioned, this region of Lake Baikal has a particularly dry climate, with precipitations that generally does not exceed 250 millimeters per year (one third of the average rainfall in southern Europe). 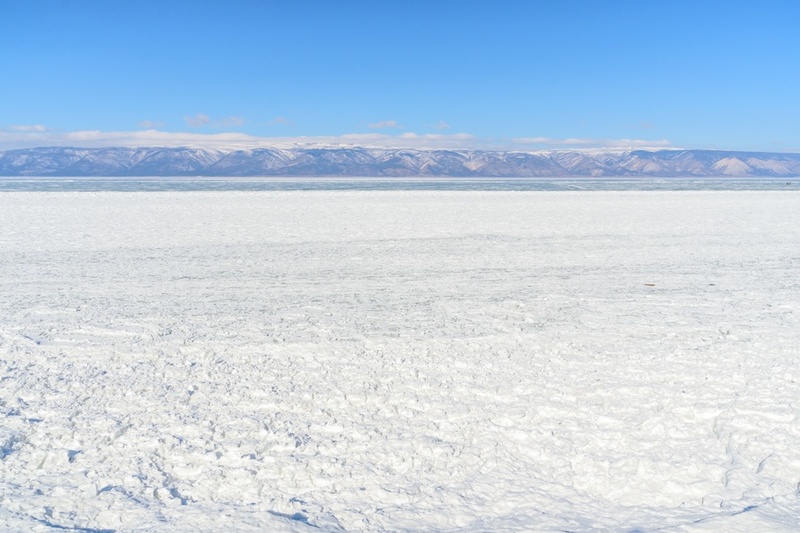 A beautiful panorama of Lake Baikal, showing an endless expanse of snow-free ice cover. 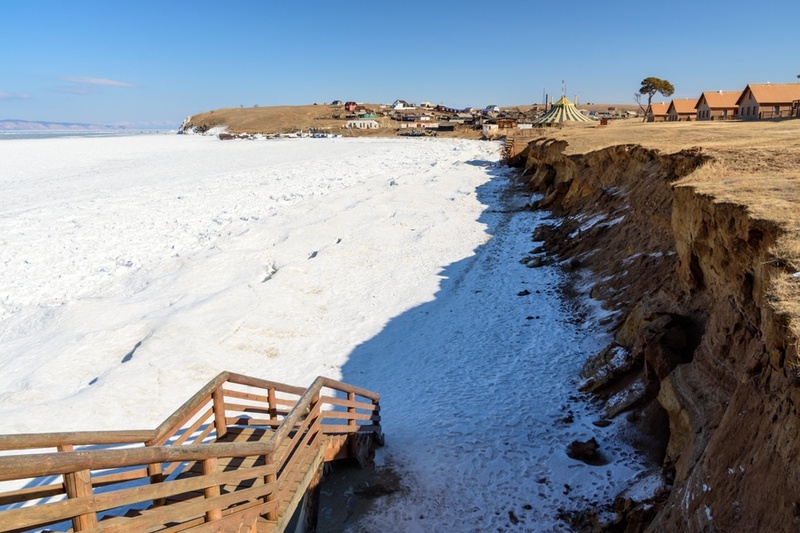 The path descends into a bay covered by ice, from where the Shaman Rock can be accessed. 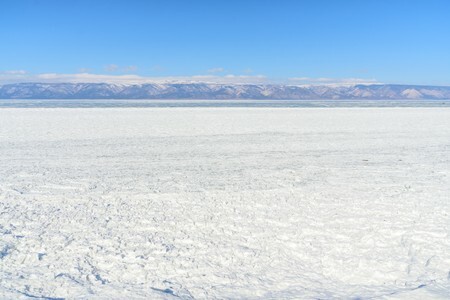 In the bay there is lot of ice piled up in small pieces. The Shaman Rock near Khuzhir, on Olkhon island. 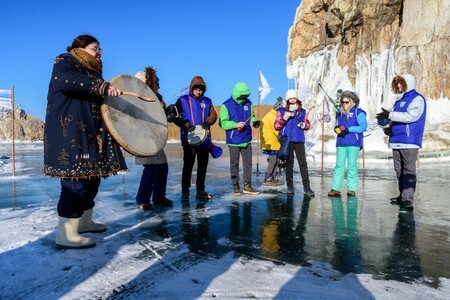 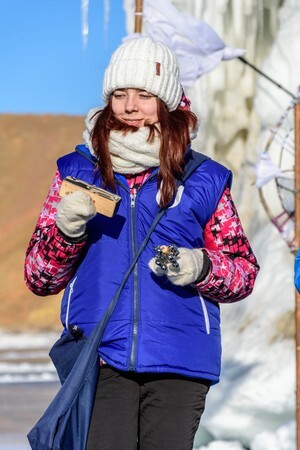 With some luck, we come across a festival related to Shamanism which was held on the ice not far from Shaman Rock and where visitors may see locals singing and dancing in their traditional clothes. 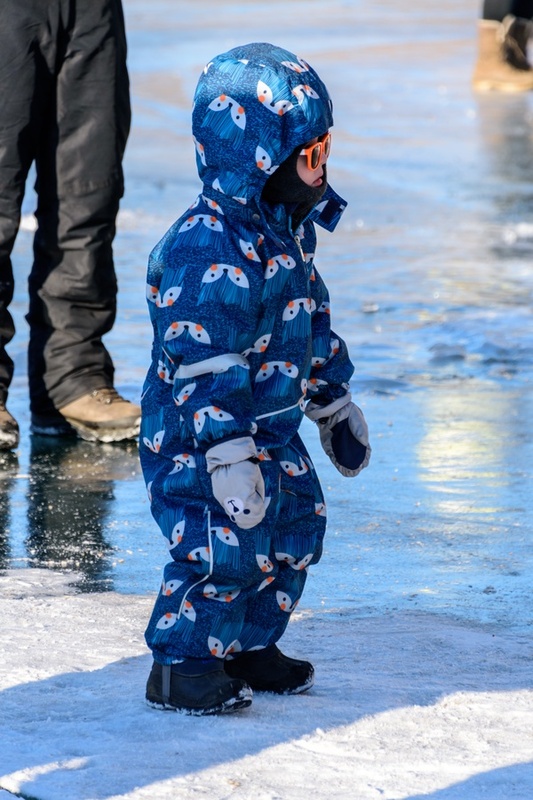 A child participates to the festival well protected from the cold. 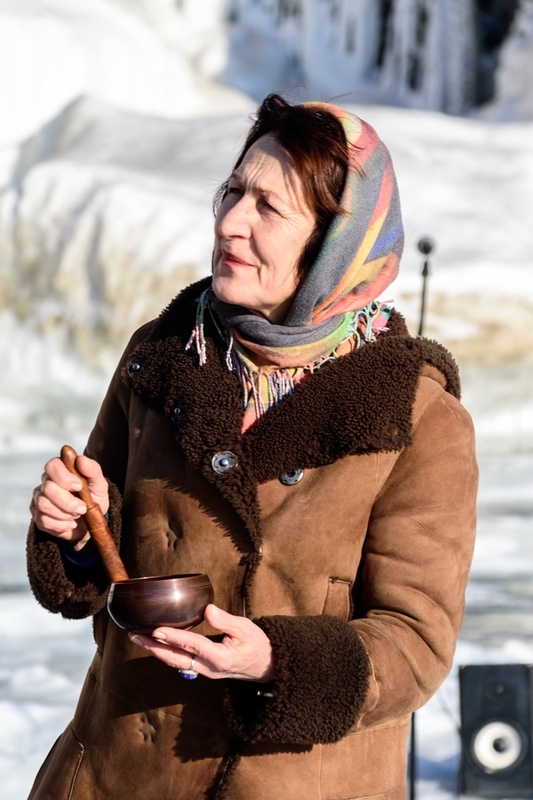 Some instruments used to sing during the festival. 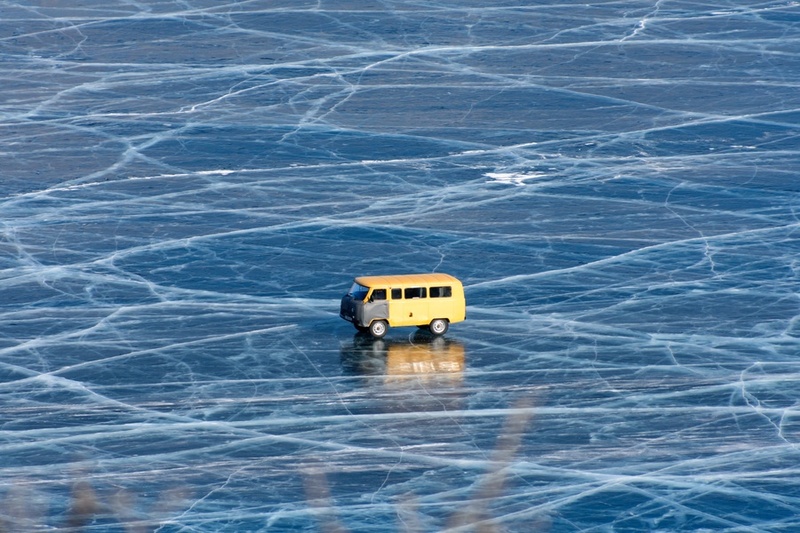 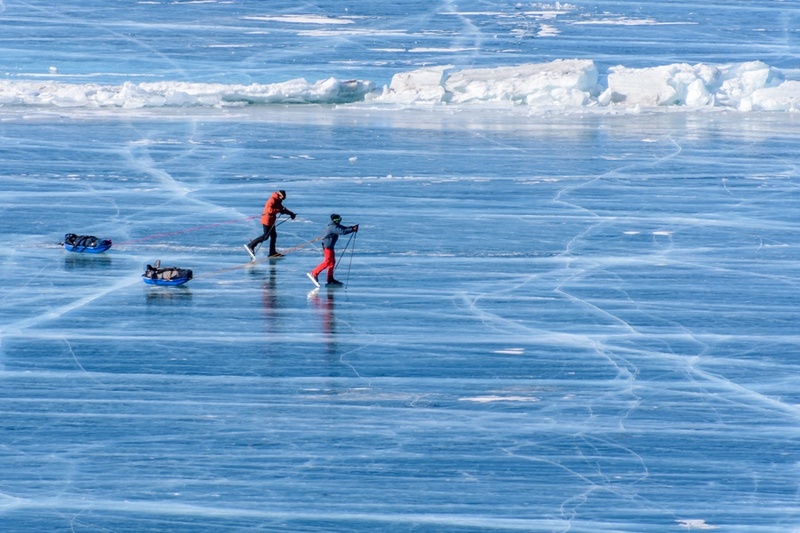 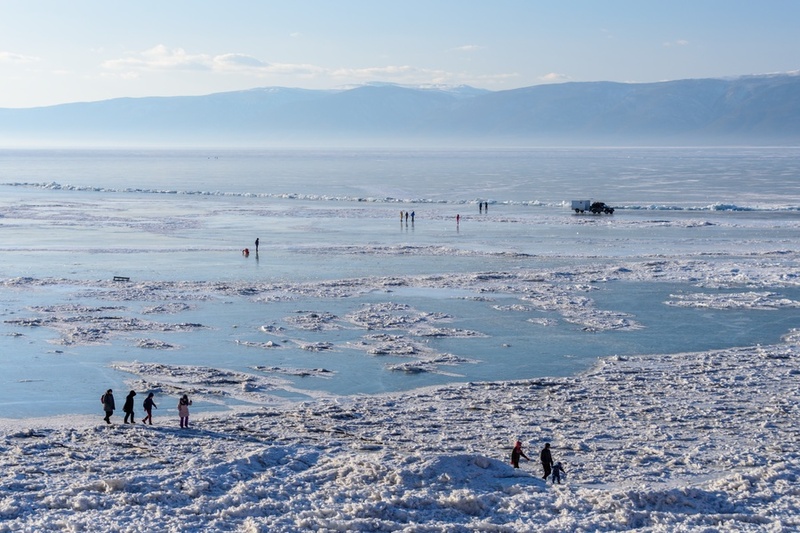 After the festival, some people walk around on the ice of Lake Baikal. 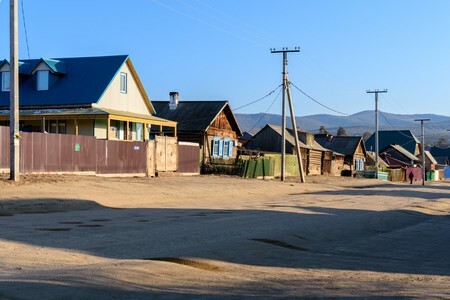 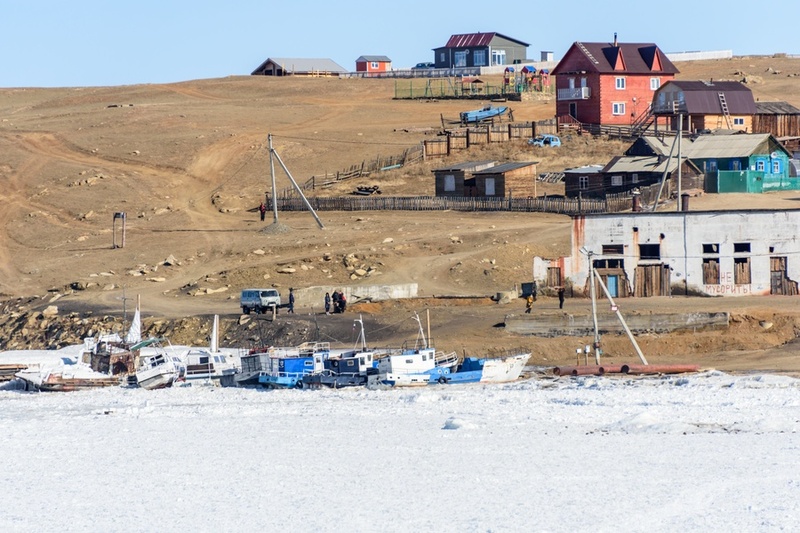 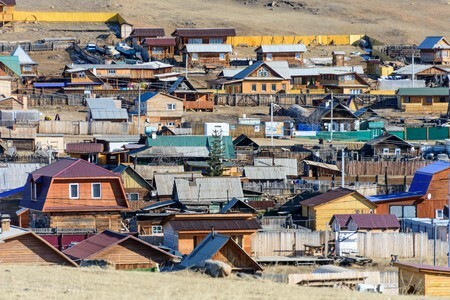 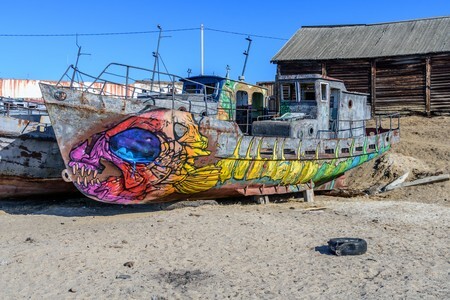 The town of Khuzhir (or Chuzir) is the main inhabited center of Olkhon Island and is home to just over 1000 people who live mainly on fishing, farming and limited agriculture. 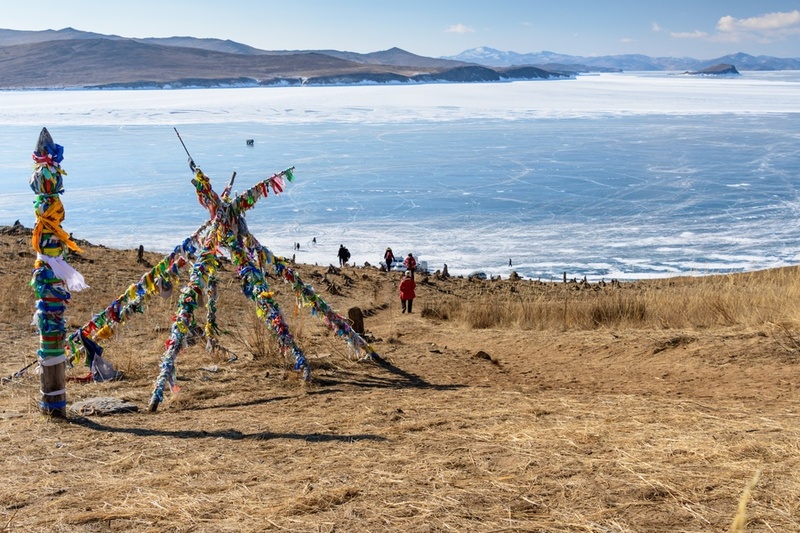 Tourism is growing strongly, both because of the evocative landscapes and also because of the importance of this sacred place in Shamanism among the ethnic minorities of Siberia. There are no paved roads in Khuzhir and there are no traffic lights. 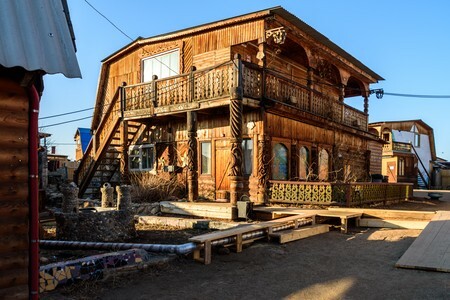 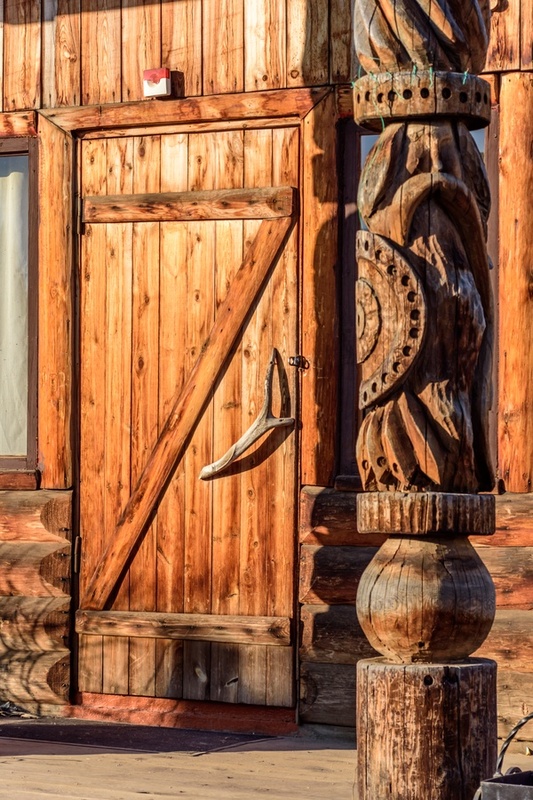 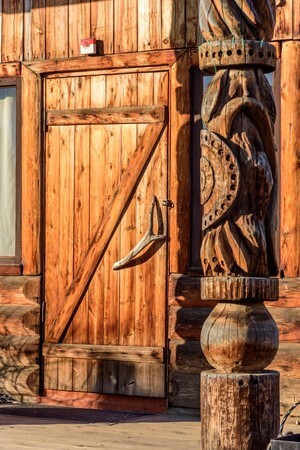 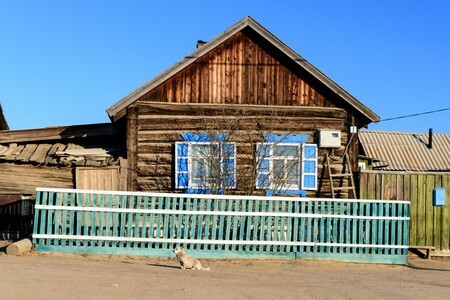 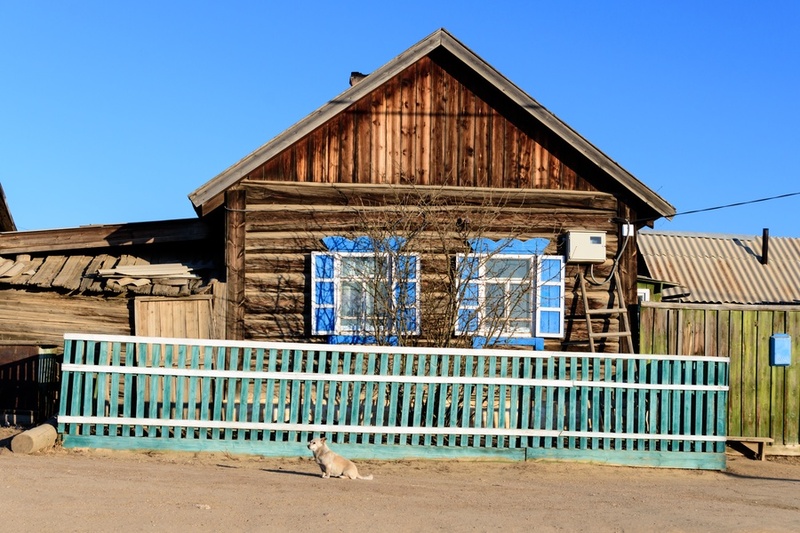 The older houses are in traditional Siberian architecture with walls built with whole logs. 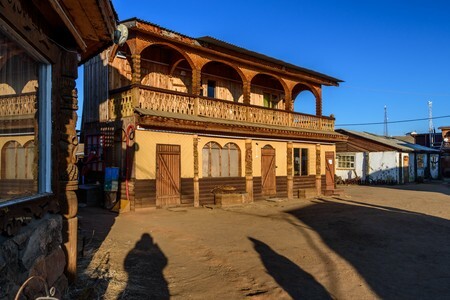 A historic district of Khuzhir with elegant houses in traditional architecture. 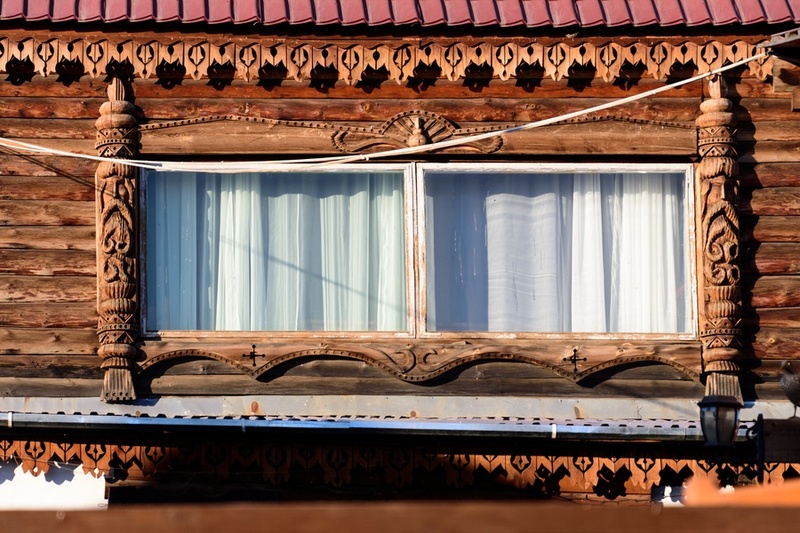 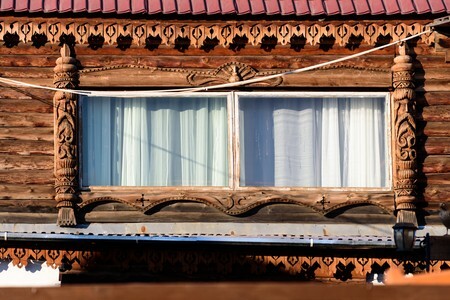 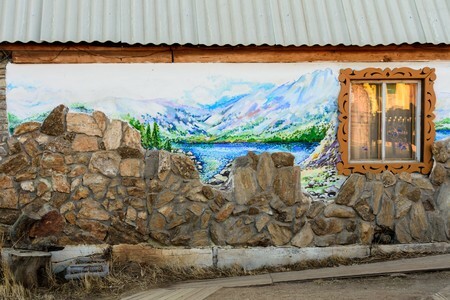 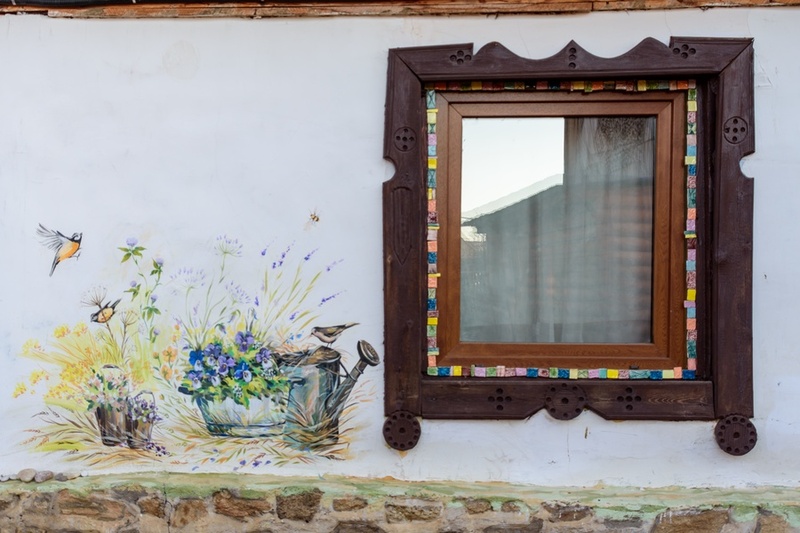 The beautiful windows and facades of traditional houses , decorated with murals and wood carvings. 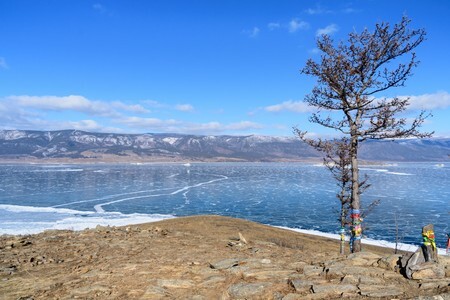 Where to stay on Olkhon Island? In Khuzhir and on Olkhon Island in general, there are a good number of lodgings and local families providing home stay, due to the growing tourism. 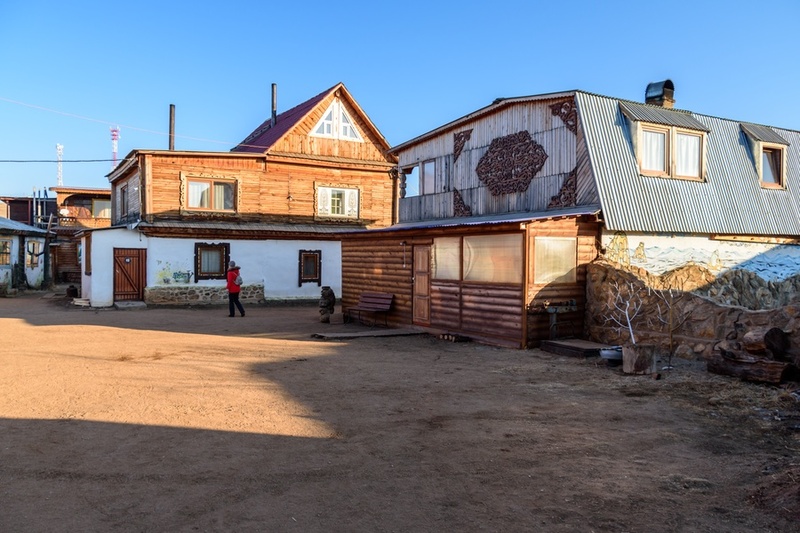 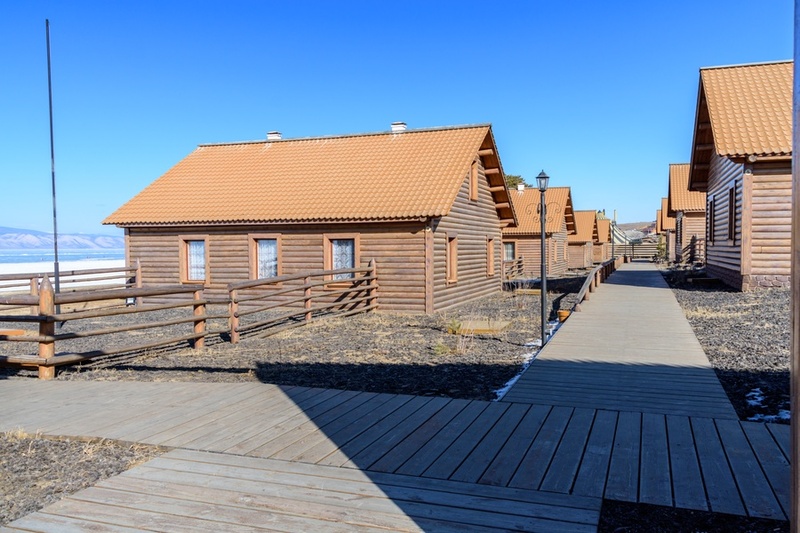 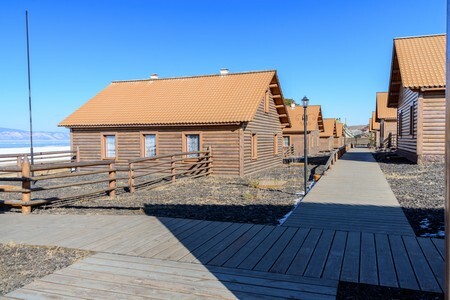 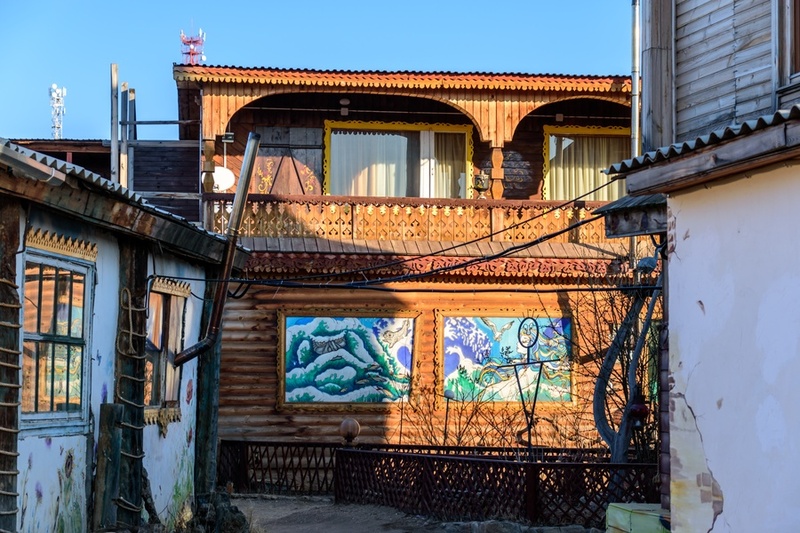 The Gostinichnyy Kompleks hotel offers spacious bungalows just a few meters from Lake Baikal and not far from the center of Khuzhir.